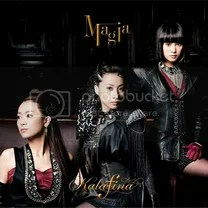 Magia is the ninth single by Japanese group Kalafina, released on February 16, 2011. The title track was used as the ending theme for the anime Mahou Shoujo Madoka Magica. The single reached #7 on the Oricon weekly charts, and charted for 21 weeks, selling 48,679 copies. Magia is by far one of Kalafina’s best and most epic songs to date. It’s also the first rock A-side by the group, well I’ll say. I’m always impressed by how ‘in your face’ this song is with its percussion, electric guitars, strings and gong effects. HIKARU takes over from WAKANA as the lead singer of this song and we all know HIKARU is at best in fast paced and aggressive songs like this one. Kalafina has gone evil in a good way, I adore it! Wait, what? snow falling is definitely a complete 180 from Magia since it’s almost acapella. There’s just a piano and vocals by WAKANA and KEIKO for most of the song, when HIKARU sings her part a violin joins in as well. This song is like a lullaby, easily putting you in a dreamy state. Sometimes I can’t fully appreciate this because it’s too slow and I want something more energetic, but nonetheless this is an amazing and pretty song. As one of their fewer remixes, Magia ~magic mix~ is a special song. What is not so special about this, is the fact that it sounds a lot emptier than the original. All the epic strings have been removed and it’s mostly HIKARU with some backing vocals by KEIKO doing all the work. I believe there is an erhu added to the arrangement somewhere, but I’m not sure. I prefer the original way more.